We’d love your help. 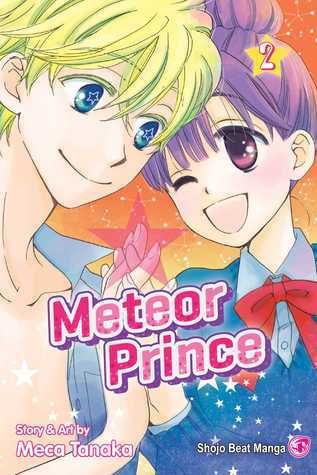 Let us know what’s wrong with this preview of Meteor Prince, Vol. 2 by Meca Tanaka. Hako Natsuno's bad luck hasn't improved, but her alien boyfriend, Io, takes everything in stride, even when his feelings for her cause him to be repeatedly struck by lightning. The two have barely started dating when a naked alien girl arrives on Earth and says she is Io's true mate. Hako really does have the worst luck! To ask other readers questions about Meteor Prince, Vol. 2, please sign up. All in all, a surprisingly good 2 volume series. It manages to pack in more events and fluff than most full-length shojo do in only 2 volumes, and somehow, it doesn't feel terribly rushed. Recommended if you want a cute supernatural romance. It was very rushed, but I really enjoyed it. I wish this series was longer! Ahhh I loved reading the continuation of this manga series! This manga is so cute and has so many hilarious moments. That's what I love about animes or manga; is that they can be so farfetched, that it can still make all sense. First read of 2019! And...it’s fluffy, sure, but there isn’t much substance in this 2-volume manga for me. I don’t think I’ll ever reread it, to be honest. But I look forward to trying Meca Tanaka’s other works in the future. I loved this ending. Everything about it was adorable, and I was so pleasantly surprised to see how much character growth there was with only two volumes. There were some lovely themes about love and destiny and how we can change our fate and learning to grow as a person. I loved that rather than being consumed by their love for one another, it helped both of them to become better, happier versions of themselves. Io's willingness to sacrifice things for Hako and his dedication to protecting her I loved this ending. Everything about it was adorable, and I was so pleasantly surprised to see how much character growth there was with only two volumes. There were some lovely themes about love and destiny and how we can change our fate and learning to grow as a person. I loved that rather than being consumed by their love for one another, it helped both of them to become better, happier versions of themselves. Io's willingness to sacrifice things for Hako and his dedication to protecting her initially causes her to feel guilty, but rather than wallow in guilt, it spurs her on to become more confident and fight against her bad luck. I’m honestly impressed with how much character and story development there is in such a short series. There’s depth, time for the characters to grow, no rushing. A lot of story in such a short time. I’m really happy with this series. Plus, it’s super cute. There’s a lot of innocence between Io and Hako, even as they’re growing closer, and Io is wanting to get married at some point. We meet Hako’s family, we meet Io’s brother and Io’s fiancé. The two date a lot. Io goes under a change in order to stay with Hako, and then Hako’s is forced into a position because of her love for him. I don’t want to spoil what happens, but while it’s sad, the ending is super cute. The artwork is so pretty and the characters are so fun; the romance is adorable and sweet. This short series just plain makes me happy, and I’m so glad it was licensed. I hope we get more from this author, because this one was great. Meteor Prince's finale is just the right mix of bitter and sweet to really work. While at times the series (duology?) seemed to err more on the cheesy side, the selfless decisions of the heroine and the determination of the hero worked to make this feel like a triumphant ending. While I might have enjoyed reading more about them, and am still kind of peeved at Tanaka for her sidebar about their future, I also think this was just the right length to make it satisfying. Oh, why are you only two volumes? This 2nd volume felt rushed, so I gave it 3 instead of 4 stars. I love the storyline and characters, but it would have been sooo much better if it was at least 3 volumes. This series was so short! I felt like it could have been expanded. As it was it felt very rushed. Still, it was really cute and had a happily ever after! This duology was cute, funny and adorable.